The second act of Sue Tiley, model and muse for renowned portraitist Lucien Freud. saw her become an artist, following in the footsteps of her famous friend. She went from Benefits Supervisor Sleeping (1995) to Fendi collaborator (Spring 2018), enlisted by creative director Silvia Venturini Fendi . It may seem like an unlikely collaboration but steeped in history, Tilley’s contribution to culture—be it as the subject of a Freud portrait, a biographer of performer Leigh Bowery or as an artist in her own right—is irresistible to the Italian luxury goods house. Venturini Fendi was introduced to Tilley’s work but the head stylist of menswear at the brand. The works chosen to appear in this collection? A corkscrew she had for years, illustrated, appeared on a leather jacket; a painting of a lamp on a hoodie; a peeled banana on a knit sweater. Venturini Fendi was fascinated with normality. She chose the above items to feature not only for their artistic appeal but for their commonplace nature. Normality, and oftentimes heightened normality, have become a recurring motif in the fashion vernacular in response to the fickle luxury market. Demna Gvasalia, Martine Rose, Glenn Martens at Y/Project have all been exploring the subject, simplifying garments, commenting on corporate culture. Venturini Fendi wanted a slice of that cake too. She wanted to adapt the corporate wardrobe to the current cultural climate. There was her iteration of the digitalised boardroom: she deployed outfits that convincingly conveyed the put-togetherness of the business wardrobe—an immaculate exterior but the bottoms—loose trousers and shorts—would beg to differ. The 80s undoubtedly played a huge role in the materialisation of this show. She reintroduced the heavy logo-mania that make Fendi products sell like hotcakes. She had check bombers and baseball caps, campy sleeveless sweaters, short sleeves and skimpy shorts. Pastel-hued windbreakers turned up also. On paper, it’s just another menswear collection. It ticks all the boxes for the standard menswear show. 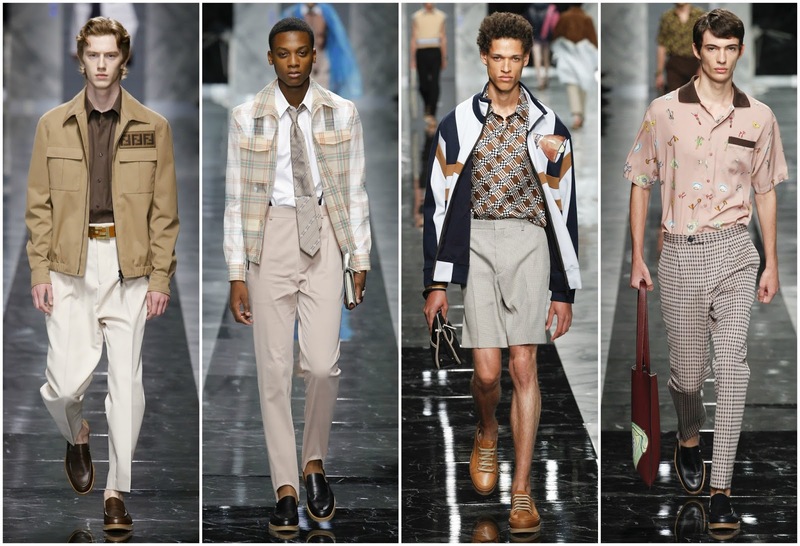 Where it had character was with the Fendi signatures—the unmistakable tactility, the boxy shapes. Where the epochal influence hindered proceedings was that it rang like a campy caricature of 80s masculinity, and it contrasted with the more sophisticated aspects. Fendi’s adaptability can often prove to be its most difficult hurdle to overcome. It tasks itself with answering a complex question: how does one appeal to the modern man without alienating the existing fanbase and amassing a new, younger following… in the digital age… without losing sight of house values? Sometimes it masters the balancing act but other times it falls flat on its face. This 80s-lensed relaxed corporate daydream, for its misses, had some resounding hits. Amidst the polished styling there were imperfections that couldn’t be masked.